I have a confession to make, one that I imagine a fair few of you will be quite displeased with: I am not a true Mario fan like most Nintendo loyalists are. I never have been, I never will be. It's not as if I dislike the Italian plumber or the adventures to save the Princess that he finds himself embarking on, it's just... I prefer other franchises. It's not exclusive to the Mario series, either; I'm also not fond of Zelda like most others appear to be (and there goes the rest of my audience). Instead, my loyalty lies solely with a bounty hunter, one who is a known identity but doesn't receive anywhere near the recognition that those dressed in either blue and red overalls or a green tunic do. Samus Aran's adventures across the galaxy captivate me like no other series of games can, the immense isolation and solitary exploration resonating with me in a far stronger way than anything the Mushroom Kingdom or Hyrule can provide. But despite my allegiance to the Metroid series, I still do enjoy Nintendo's bigger, more popular franchises, and it's an adventure through another galaxy that has recently caught my attention in a way I wasn't expecting. Super Mario Galaxy is filled with delightful moments that really demonstrate why the Mario franchise is so popular, and undoubtedly Nintendo's best. Even being aware of some of the game's little pleasures before playing didn't detract from their overall impression on my experience, and the enjoyment that comes from it. 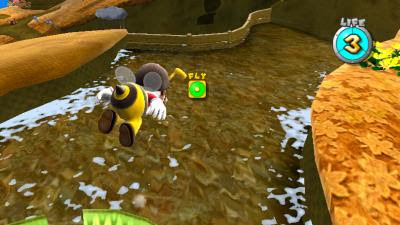 The first time I became Bee Mario was amazing; wall-jumping to the top of waterfalls as Ice Mario was a basic yet empowering moment; stumbling upon the mushroom that allowed me to fly around the environment at my leisure for brief periods was wonderfully relaxing; and discovering Luigi's presence in the game was a neat -- if expected -- distraction, his acquisition of stars to help me in my quest a pleasant surprise that actually gave the man a purpose, a welcome change from previous games. It doesn't really matter what Mario was doing or which galaxy he was exploring, everywhere I looked was yet another moment of delight, and each session I had with the game left me with a smile on my face. 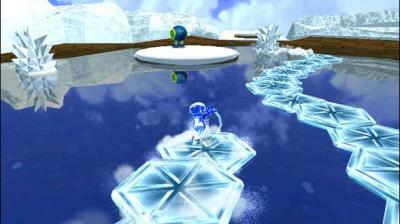 The thing that intrigues me the most about my time with Super Mario Galaxy, however, is that despite all of these delightful distractions the feature that stands out more than any other is the change of perspective that we're introduced to within moments of first playing the game. It is easy to look back and take it for granted now, but damn if it wasn't a special moment that very first time we saw it in motion on our TVs, the Wiimote and Nunchuk in our hands ready for an unpredictable adventure in a familiar, yet unknown setting. It was one of those rare gaming moments that capture the essence of why I -- and I'm sure most of you -- play videogames, and it's an experience I will never forget. Despite the immense pleasure I had as described above, I'd be lying if I didn't admit that Super Mario Galaxy frustrated the hell out of me at times. There were countless situations where Mario would die because of something really silly -- such as being knocked over by an enemy and falling off the edge of a platform as a result, or not being able to recover in time once I had fallen into some lava** -- and my reaction to these moments was impatience and, in some cases, enough anger to cause me to turn the Wii off completely. But on reflection I would always forgive the game, realising that my frustration was usually my own fault. That's the beauty of Super Mario Galaxy and indeed, most Nintendo games: no matter how annoying they can sometimes be, the good most certainly outweighs the bad, and the bad stems from the player's own issues rather than from the games'. If something is difficult, it's because the player isn't concentrating enough, or taking advantage of a set of skills taught in previous areas of the game. Furthermore, whatever may be posing a challenge is always possible -- nothing is unobtainable, no challenge unbeatable and every single player can achieve the desired outcome if they focus and strive to overcome their moment of difficulty. It's the simplicity of Mario games that makes them a joy to play and definitely why he is gaming's most prominent (not to mention prolific) and recognisable identity around the world. And besides, without a challenge the Mario franchise wouldn't be so rewarding, and we can't have that, can we? 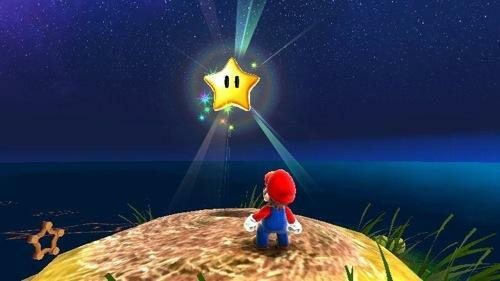 Looking over what I have said above, I've almost made a love letter to Super Mario Galaxy. And indeed, if that's what I've done, then I couldn't think of any other game that deserves it. The sheer fun and irresistible charm that permeates the game is overwhelmingly compelling, and having such a unique change of pace for the Mario franchise be filled with familiar characters, items, locations and remixed tunes is the icing on the already incredible, not to mention tasty, cake. I may not be the biggest Mario fan around, and I'm certainly not a champion of his games like most are, but even I can't deny the excellence that resides within Super Mario Galaxy. It's a ride I will never forget, and if you haven't played it I assure you that when you do, the experience will last with you forever. *I know New Super Mario Bros. Wii released last year, but I think it's fair to say that the game -- despite it's fantastic, devilish fun -- wasn't a true installment like Galaxy was. **And what's with Mario only having three bars of health this time? I know there's a mushroom that doubles it, but it still seems to be a strange design decision. I completely sympathize with the difficulty you have with regards to with attachment to Mario as a character, I feel much the same way - no doubt because I was raised on Sonic games and it took me an awful long time to get around to the Mario games offering. Michelle -- Well I was raised on everything Nintendo, so I find it surprising that I don't share the affiliation with Mario that most do. I've played most Mario games though and have enjoyed them all for the most part. I agree that it's unfortunate there is very little coverage or appreciation for the games you mention, but it's not too surprising really. If you've played one Mario Kart you've played them all (not a bad thing) and the other two are probably too heavy on story for a lot of Mario's market to bother with. This generation's focus on narrative in games and the subsequent appreciation gamers from all demographics are slowly but surely forming should mean that both the Paper Mario and Mario & Luigi series receive at least some of the recognition they deserve. There was already some evidence of that last year when people were discussing Bowser's Inside Story, so we're getting somewhere. Slowly.